Went to Finis’s & Doris’s tonite. Mrs. Teters is there. She told us about the sanitorium. Billy & Johnny have a billy goat. Moma got 2 new bedspreads for boys beds. The Rector boys have a goat — that otta keep ’em busy . . . keeping the goat out of things! I don’t know who Mrs. Teters is, or exactly what she told them about the sanitorium. What I can tell you about the sanitorium is that it is a big fancy building in Macon with quite a history. It was built in 1899-1900, as the Blees Military Academy, by Col. Frederick Wilhelm Victor Blees. After Col. Blees’ death in 1906, his wife operated the school for 3 more years, at which point bankruptcy forced her to sell it. It was purchased by four prominent Macon men. These men approached two doctors, both with the name of Still (Charles and Harry, sons of A.T. Still, the Father of Osteopathy), about converting the building into a sanitorium. 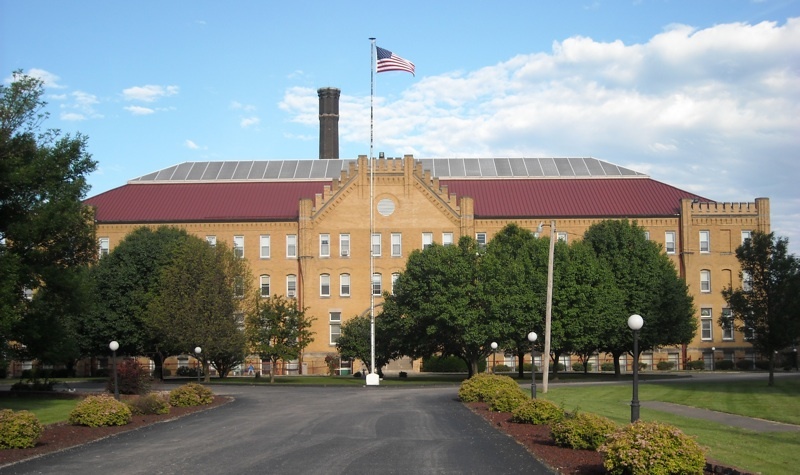 The Doctors Still asked Dr. Arthur Hildreth to join them, and on March 1, 1914, the Still-Hildreth Sanitorium became the world’s first osteopathic sanitorium, otherwise known as an “insane asylum”. I don’t know how long the sanitorium operated, but after its closing, the property later served as a Missouri National Guard Post. When I was a child, the buildings had been pretty much abandoned and let run down. It was creepy, scary, and to add to that, they used to host haunted houses in there at Halloween. Hauntings aside, I took a (daytime) tour of the building at one time, and the “cells” for the patients were just plain scary and totally depressing. In danger of being demolished due to its condition, the Macon County Historical Society rallied to save the property, and the building was added to the National Register of Historic Places in 1979. Enough with the history lesson, right? 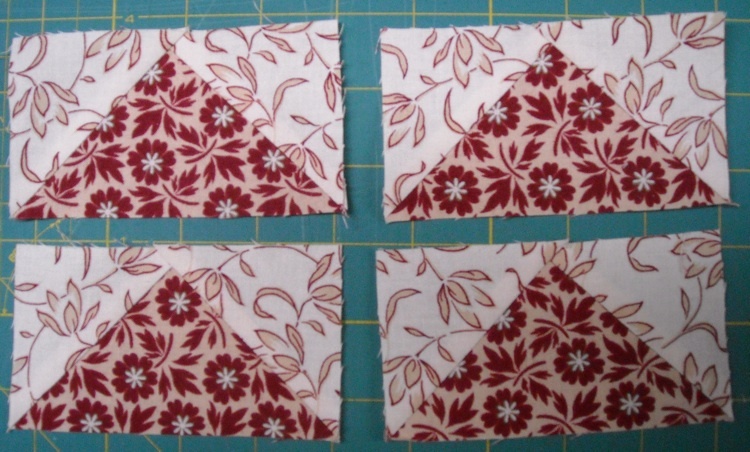 Let’s get to quilting . 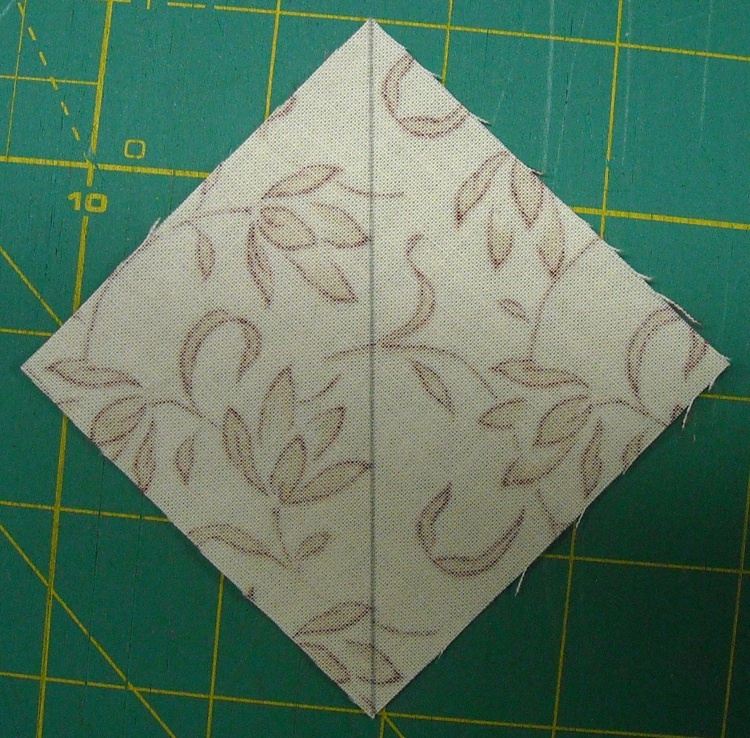 . .
Today you’ll need all the squares you have cut so far for Block 8. 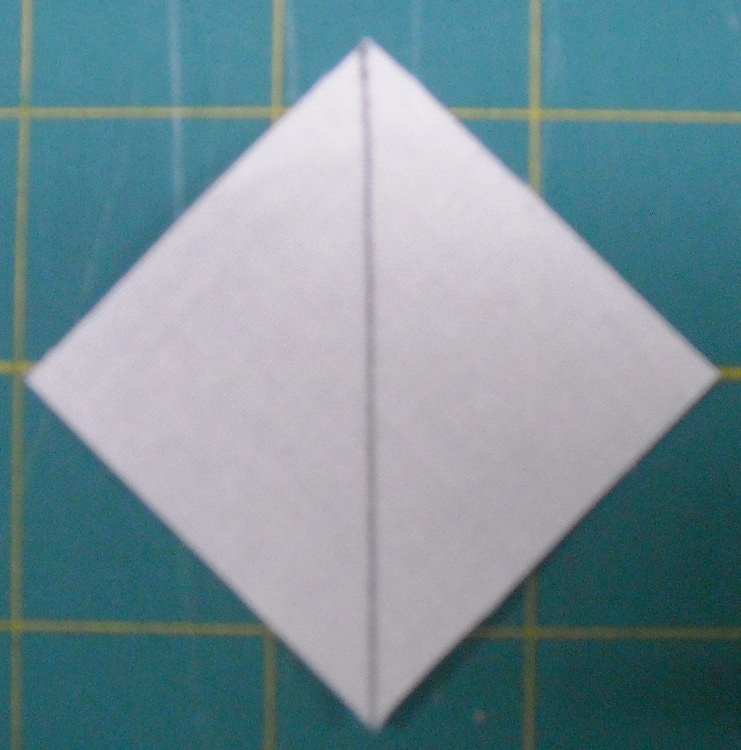 On the back side of each small square, draw a diagonal line with a marking pencil. And yes, you know what’s coming next — more Flying Geese! Are you tired of them yet? Do you have the process memorized? 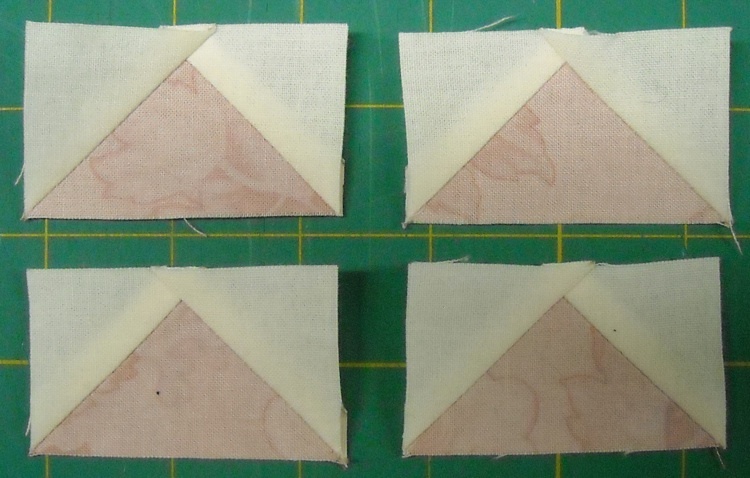 Here’s the tutorial, just in case: Flying Geese Tutorial. When you’re done with those, store them back in your “Block 8” baggie. My sister, Katy, is six years younger than me. She has a better memory, and apparently paid more attention to stories when we were younger. (I was never much of a history buff.) We’ve been discussing all the stuff we can’t seem to figure out about the family’s history during this time, and her memory unearthed some stories that Grandpa told her, so we’ve been able to put a few more pieces of the puzzle together. Appliances were also rationed because they were in short supply, as all metal was being put into the war effort. To get items that were rationed, you had to have “stamps”. I asked Chris how the stamps worked . . .
Grandpa was given a stamp for a refrigerator from a man who had the stamp, but then did not have the money with which to purchase the refrigerator. The poor fellow had ended up having to use what money he had on a family emergency, and could not use the stamp, so he gave it to Grandpa, and Grandpa bought the refrigerator. 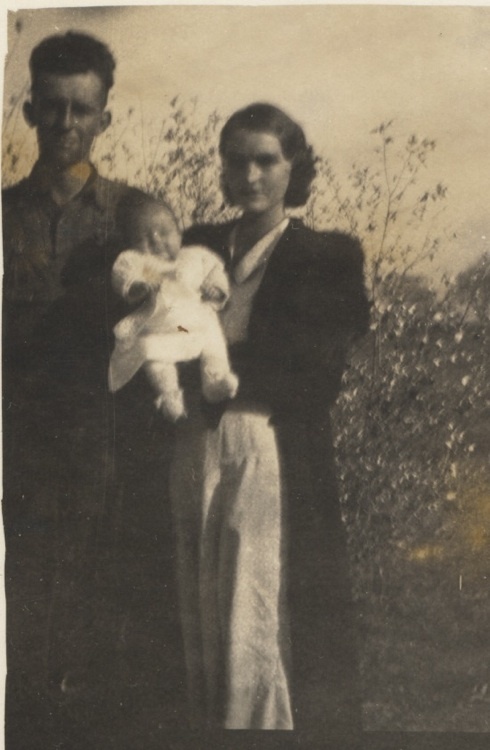 Katy and I have often spoken of how Grandma, whenever a national “disaster” would happen, would tell us: “You better get to the store and stock up just in case.” Folks who lived through the Depression and the War had it hard, and were forever wary that it could happen again. 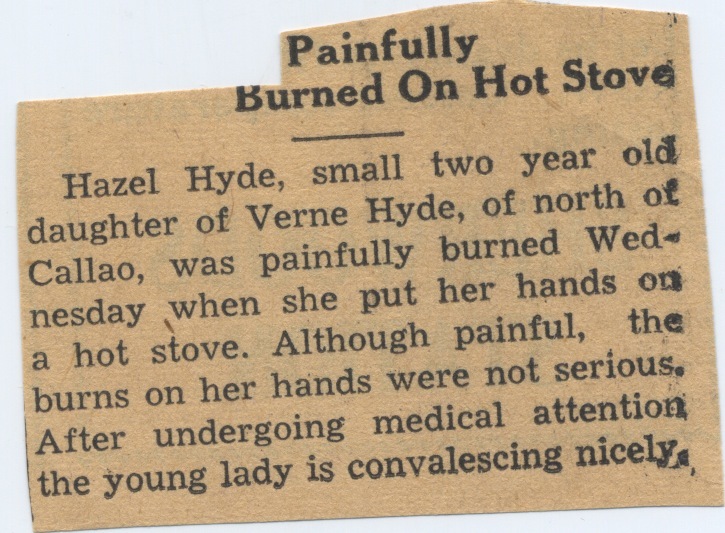 We still have no idea how long the Hyde family lived in the Kansas City area, but if I find out, I’ll give you an update. Meanwhile, we’ll move on, and I’ll tell you what happened between life in Kansas City and Hazel beginning high school in some upcoming posts. Here’s a little background on the family you’ll be reading about during this project. 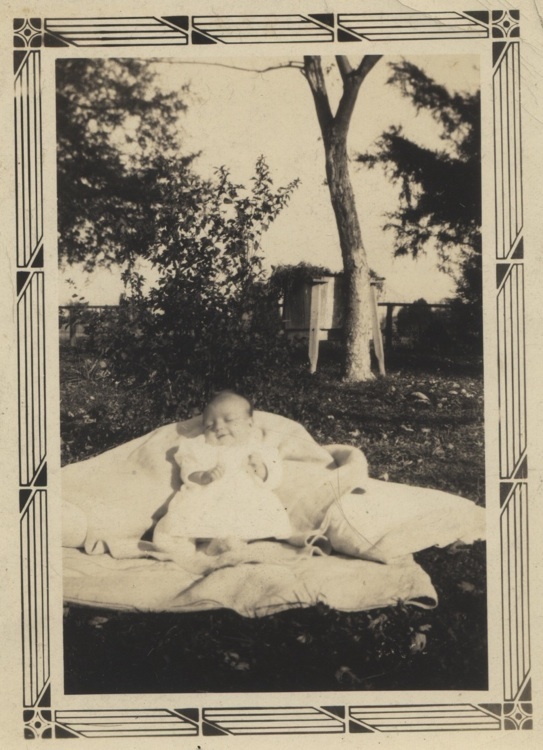 If you read this post: It All Begins, you’ve already been introduced to Hazel as a newborn. Well, what happened in between birth and January 1, 1951? Mr. & Mrs. Vern Hyde of north Bevier are announcing the birth of a nine-pound son, born Tuesday evening, August 14. This is the Hyde’s second child. We are sorry to report Vern Hyde of east Callao has been quite ill. It was found necessary to take him to Brookfield to the McLearney Hospital for treatment. Vern was reared in this community and has many friends who were sorry to hear of his illness and wish for him a speedy recovery. Mr. & Mrs. Vern Hyde of east Callao are announcing the arrival of an eight pound baby boy, born Thursday, July 24. 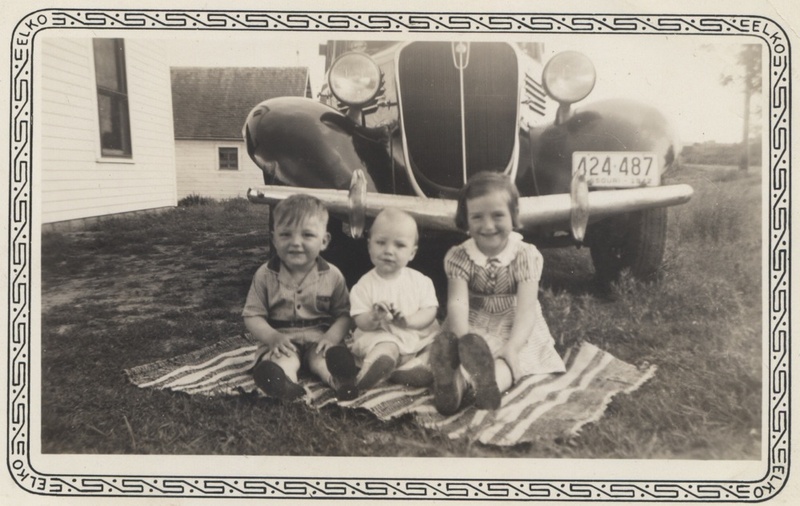 Here’s a snapshot of the three together, taken in 1942. Meanwhile, of historical note on the global scale . . .
On September 1, 1939, without warning, Germany declared war on Poland, setting off the beginning of World War II. Although at first declaring neutrality, the United States was plunged full-bore into the war when Pearl Harbor was attacked on December 7, 1941. Just 3 days ago, we marked the 68th anniversary of “the day that will live in infamy”. 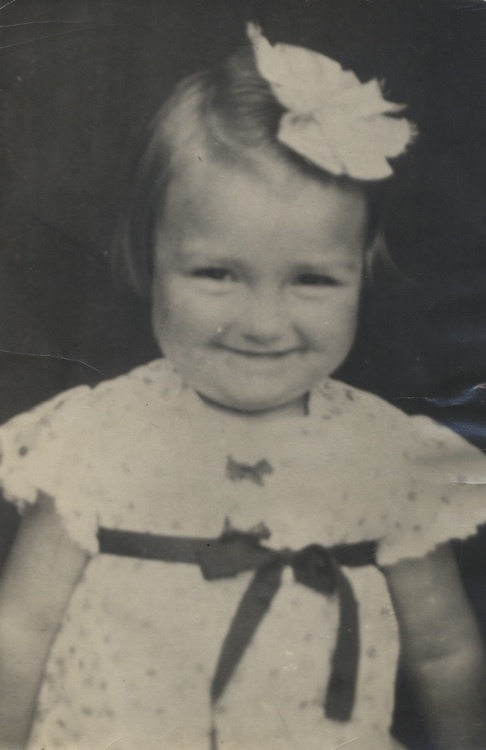 Hazel Ilene was born on September 19, 1936, in the little tiny town of Callao, Missouri. 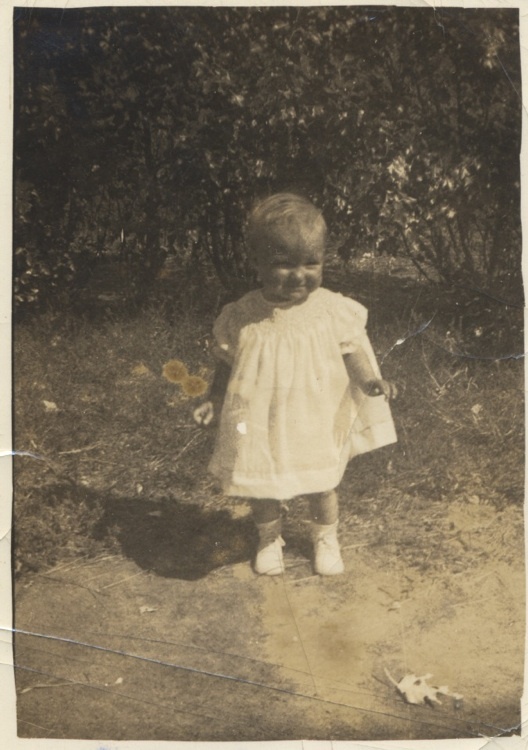 The first child and only daughter of Mildred (Rector) and Lavern Hyde, she was followed later by two brothers, Donald and Larry. Mr. and Mrs. LaVern Hyde of near Bevier are announcing the birth of a daughter born Saturday morning whom they have named Hazel Ilene. For Sale: Two box springs and mattresses, standard twin size beds, practically new. Reason for selling: replaced with 7 foot beds account of boys growing tall. Call MISS YOUNG, 5384 between 9:00 and 4:00. Weber’s Meadow Gold Ice Cream, Full Quart Brick Cream, Assorted Flavors 29¢. Unsettled with showers probable in west and north portions tonight and Sunday. Somewhat warmer in north portion.